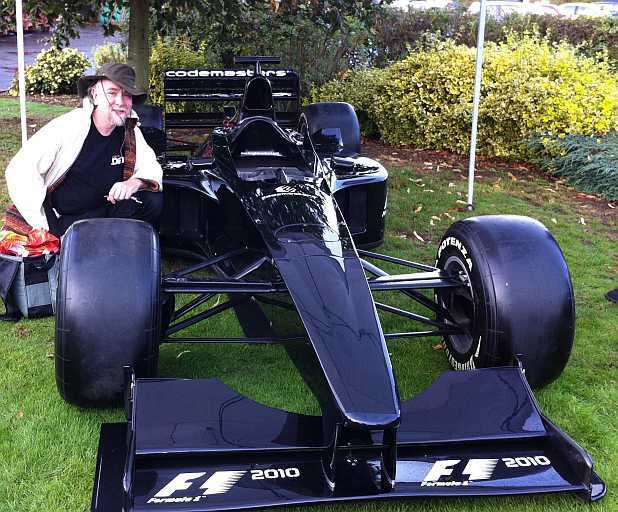 This page collates background information about my work in the Central Technology department at Codemasters since 2003. For more than a decade I worked primarily on sound and streaming data systems for leading UK publishers Codemasters. I made early contributions to several of their football titles, where my voice codec enabled the 150,000 speech samples used in the commentary system to fit the DVD distribution without the quality and efficiency problems caused by standard Windows formats, and on the 2005 incarnation of their Colin McRae Rally franchise, where I worked on the cross-platform game audio and wrote a custom nine-stream DVD audio player on the PlayStation 2 for stereo weather effects, Dolby Pro-Logic 2 ambient sounds, and co-driver commentaries. Rally did well in the UK console charts, despite the contention for the Christmas season, reaching number 6 on PS2 and Xbox soon after launch and remaining in the top 20 three months later. I've also picked up credits for audio and streaming optimisation work on several games published by Codemasters, including Worms Mayhem and Brian Lara International Cricket, both developed for PS2, Xbox and PC, and published in 2005. Brian Lara Cricket spent four weeks at number 1 in the UK all-formats game charts in the summer. Since then I've been working on platform-specific audio systems for the new Brian Lara Cricket and Colin McRae Rally games, performance and reliability improvements for external publishing deals, and several internal projects. My most recent technical credits were for work on a couple of rather visceral titles: the Clive Barker game Jericho, published in 2007, and 2009's Operation Flashpoint: Dragon Rising, where I led audio aspects of the pre-publication production engineering, as part of the Central Tech optimisation effort. Oddly enough the head honcho at Codemasters is now Rod Cousens, who ran Quicksilva twenty years ago when I designed the Magic Micro Mission game for them, and David Gower (who appeared, like me, on the associated TV series) provides commentary for our cricket games. And the artist who painted several package covers for my programs in the 1980s now runs a company developing a radically new type of game based on my proof of concept and optimised Digital Signal Processing systems (see later). So while it's a much bigger industry, it seems the company names change much more often than those of my associates on the UK game development scene. One of the first things I was asked to do when I joined Codemasters was investigate a proposal for a PS2 rhythm-action game that worked with the player's choice of music, from CD - a bit like a cross between Vib Ribbon and Dance Dance Revolution. Within ten weeks I'd coded a proof-of-concept that could read and replay CD audio using a bunch of threads on the IOP (the IO Processor which masterminds disc access, memory cards, controllers, and PS1 emulation) and pass data blocks up to the EE - the PS2's main 128-bit multiprocessor Emotion Engine - for filtering and analysis. This prototype was able to extract beats and interpolate between them on a select few CDs, scrolling various views of the track across the screen with beat times overlaid. I demonstrated this to company founder Richard Darling and Chris Southall, our CTO at the time, and was given the thumbs up for further development, as a collaboration between Codemasters Audio, Graphics, QA and Central Tech departments, with one of the third-party firms that are the mainstay of UK game development. But who could do it? After casting around for developers with relevant experience, we hit upon Broadsword Interactive (run by Dave Rowe, the artist mentioned above). Their lead programmer Jim Finnis asked several intelligent questions, and got the commission. More than two years and many experiments later, Dance Factory was released in Europe, Australia (where it was still in the PS2 top ten six months after launch) and North America. I've got two credits - for the Proof of Concept and Signal Processing - and been involved, along with Jim and his sidekick Steve Rose, who coded the dance generator, in most aspects of the game design, development, and related patent applications. I ought also to laud the sustained efforts of producer Dave Brickley, without whom such an original game would surely never have reached the shops. I could probably write a book about the development of Dance Factory, but I'm not sure whether many people would read it - the game is more approachable! However there are lots of interesting things to say, which reveal special things about the way this game was made as well as insights into the 21st Century development process. I've deliberately skipped details about the way the game works, because those are proprietary to Codemasters and subject to patent protection. Contact our corporate lawyer Julian Ward if you want to know more, especially if your company is interested in licencing the unique technology, e.g: United States Patent 7528315, which was granted in May 2009. With its open-ended support for CDs the developers never heard - including ones unreleased at the time we wrote the game - Dance Factory required an exceptional QA and testing effort. Each time a new build of the analysis and dance generation code was available, Dan Flannigan's dedicated QA team had to dance their way back through our test suite, consisting of more than a thousand songs, ranging over 40 years and many genres, to check and rate the expected improvements and make sure those had not introduced problems on any tracks that previously worked well. However big the test suite, there's always going to be lots we've never tried, so our challenge was to ensure sufficient variety of coverage to make sure that Dance Factory has a good crack at anything players throw at it - with the possible exception of "Let's speak Spanish", a language course one magazine playfully sumbmitted for dance generation - if that's really what you want to dance to, you'll get what you deserve. The challenge of testing and refinement explains why Dance Factory spent three years from concept to release. Within a year or so we had it working reliably on typical modern dance music with a strong, regular, beat, but we decided this did not live up to the potential of the concept and went back into a fresh research phase, initially with no limits on the RAM or CPU time for analysis. To get the dance quality we wanted on classic tracks, as well as sequenced ones, we deployed all the resources of a Sony T1000 devkit - originally marketed as a PS2-based super-computer workstation, with four times the main RAM and IOP (32 bit Input/Output Processor) memory of the stock PS2 - and let the multiple processors spend twenty minutes processing each song, digging out all they could about not just the the beats but the structure, patterns and tempo changes in the track. I then production-engineered that 'optimised C++' code, rewriting it in machine code to run across multiple CPU pipelines, shoehorning it into a third the space and speeding it up to do the same job - and better - about FORTY times faster. This exploited the parallelism of the PS2 processors - where nine-tenths of the processing power is in the vector units, rather than the 128 bit MIPS R5900 CPU that runs generic code ported from other platforms - to the point where Dance Factory can generate dances at about seven or eight times real-time. So a typical CD track can be analysed in around half a minute - less than the loading time for many PS2 game levels - while at the same time Dance Factory runs the Cubric minigame, with 24 channel music and sound effects. So players don't have to wait around, even if they want to generate dances - including optional Eyetoy moves - for a whole compilation album at one go. Once this analysis has been performed there's no need to do it again; a map of the album is stored on the memory card, labelled to identify the CD and recognise it - or another copy of the same disc, parhaps on a friend's PS2 - when you want to dance to the same disc later. So the deep analysis only has to be done once; after that the memory-card data can be used to generate a range of synchronised dances with varying difficulty levels and features like fitness (calorie counter) and creature (dance avatar) modes, within a few seconds of re-inserting the disc. Even if you don't have the original memory card, the dances for a given setting are consistent and repeatable - a requirement established from the start by Richard Darling - so anyone else with the same CD, a PS2 and Dance Factory can learn the same dances and compare scores with you later. The official line is that Dance Factory works only with mass-produced CDs, but many players have found that it copes just as well with their private compilations, burned onto CD-R media. Codemasters can't guarantee this, as they don't control the quality of the media or the recorder, but it can be a great way to enhance the 'endurance mode' where you dance through a whole custom album - potentially a seque of dozens of songs, never dropping a beat. 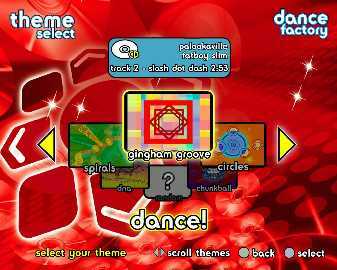 Unlike arcade-based rhythm action games, with their simplified, cut-down remixes, Dance Factory does not limit the length of a dance. It copes with whatever you throw at it. Dance Factory is paradoxically one of the smallest games ever on PS2 - it all has to fit in memory, which explains the simple background graphics, though those build up as you play and respond to the beat, unlike simpler light-synthesisers, and had to be chosen to provide variety without overwhelming the display of arrows, scores and key information needed to play the game. Graphics also have to compete for memory with the dance database - the library of varying-length dance step sequences, customised for each tempo and time signature - and the CD analysis. Dance Factory includes 29 graphic themes, some of which you see from the start and others which are unlocked through play. You never need to re-insert the game disc; we decided that would make the game too fiddly to play. Yet in another sense Dance Factory is by far the biggest game ever released on PS2 - with terabytes of 'add on' content available, on tens of thousands of commercial CDs, not to mention home-made ones. So the unusual features extend beyond the USP, pervading the game design. The music player, used in the front end and during the cubric mini-game, runs entirely on the IOP, leaving all the main memory and 'Emotion Engine' processing power for analysis and dance generation. It's a supercharged version of the sort of 'tracker' module player popularised in the 16 bit home-computer days, using similar techniques to build up tunes from short samples - but this time with 24 voices each positionable in stereo or ProLogic surround, rather than just four hard-panned left and right, and room for more samples and high sample data rates than an Amiga could manage even if all its 'chip RAM' were to be allocated to music. And to make the best of this revived technology, Codies gave Amiga veterans Allister Brimble and Tim Bartlett the job of producing the music and sound-effects; the module player is an updated version of code Sony sound guru Jason Page wrote for the original PlayStation. Another key decision involved the handling of audio in the game. Apart from the optional combo and level change sounds, chosen to fit in with all sorts of CD track and with their own volume control, it's just your favorite music that you hear as you're playing the game. So the CD audio replay quality is crucial. Whereas other games typically hack and compress custom tracks to fit them onto the game disc, we were determined to deliver the original 16 bit CD stereo without compromise. In Dance Factory it's the music you choose and love. CD Audio runs at 44,100 Hertz - 88,200 samples per second, one each for left and right speakers - yet the PS2 hardware - unlike that of the original CD-based PlayStation - works at a slightly higher rate, 48 KHz. Without special processing, the original music would play a semitone or so sharp, and faster than expected - much as film soundtracks do when broadcast to a PAL television - on the PS2. Some people might not notice, but we didn't want to mess with the pitch or the timing of your music. The maths gets rather hairy; for every 147 samples that come from the CD, the PS2 outputs need 160 that follow exactly the same curve but at a higher rate. The spacing between CD samples and PS2 ones wanders back and forth 300 times a second, and the ear is very sensitive to any 'jitter' that results from this variation, muddying the sound. The PS2 console's own CD player uses the main processor to resample audio, but it doesn't have to run a game at the same time - in fact the built-in player animates little more than a single cube. So another key bit of code I contributed to the project oversamples the CD audio up to short-wave radio frequencies - over 7 MHz - generating a precise stream of 32 bit floating-point data containing all the samples at both the CD rate and the higher (DAT-based) PS2 rate, mapping exactly between the two formats, for both left and right channels. Unlike the analysis and dance generation, this is fairly standard signal processing theory - though the choice of approach to this quickly sorts out sheep from the goats, among audio programmers - the challenge is to do it reliably, with high fidelity yet negligible load on the console, which needs to spend most of its time rendering and playing the game, not fiddling with samples. Another challenge was to give players an easy way to enter song and CD names, since there's no text recorded on a standard music CD and network look-ups don't work for typical PS2 users or any custom CDs. In theory you can plug a USB keyboard into a PS2, but few players have one and they require custom driver code and support for dozens of different key layouts in the world-wide PS2 market. Besides, we wanted to focus on dancing and gameplay, not peripheral shuffling. The initial approach to text entry worked like a 'high score' table, with the arrows on the dance mat or PlayStation pad moving a cursor over a grid of characters and another press or step confirming each entry. This is OK for short names, but tortuous for a whole album of song titles, especially after allowing for punctuation characters, regional accents, and other glyphs likely to appear in real song lists. After careful analysis of several tech entry schemes, including the many variants used on phone dials and keypads, I came up with an approach that was easy to learn, three or four times faster than the obvious alphabet-grid, and easy to customise for foreign accents and punctuation variants. The steps for some letters match those typically assigned to digits 6, 7, 8 and 9 on a phone keypad, but using the dance mat rather than a phone pad. Since there's no button in the position where '5' appears on a phone, the other letters are mapped to the four other dance step directions, in the same groups - which are simply alphabetic, with three or four letters to make the whole Latin alphabet fit on 8 buttons - used in the text-messaging ubiquitous among the target audience. So familiar sequences of taps - or steps - can be used to enter CD details, as if they were part of a telephone text message, with the layout adjustment necessary to suit feet rather than fingers. Even then, special techniques were needed. The start and select buttons - the only others on all dance mats - were allocated to delete and enter respectively. To keep the average number of steps down - and hence the speed of entry up - pairs of characters were allocated the same position, when this made sense. In the English layout you start with an open-bracket symbol; once you've entered one of those (and are writing text in brackets) the same gesture generates the matching closing bracket, without using up another grid position. This compromise precludes entry of song names with (nested (brackets)) or starting with a closing parenthesis - ) we decided this was acceptable for songs, though it might not be for programming! This is a minor benefit when using the simple unaccented English alphabet, but very handy for other languages, where the characters normally used for quoting text are different before and after the quote, or in Spanish where questions and exclamations are similarly bracketed. We ruled out the idea of making one grid with all the characters for every language on it - that would just be lazy - so the initial choice of language selects a custom set of extra characters. French players don't have to skip over umlauts to find the accents they want, and tildes, circumflex accents and other national variants appear only when needed. Accented characters are allocated by vowel and diacritical mark to specific rows and columns in a logical way that makes it easy to learn (whether you notice the organisation or not). Other characters are in the same place for all languages. Again, this involved some compromises - relatively obscure symbols, such as the Welsh accented 'w' (sorry, Broadsword!) are absent, CAPITALS and lower-case letters are equivalent (throughout the game) and if you want to enter a name with characters not native to your locale you may need to switch language setings to do so - but I think we've acheived the aim of having a consistent way to enter all the text most likely to be needed, in a familiar way that's easy to learn, with no special tricks or extra steps (sic). Once you've entered the names for a disc you can share the game save file with your friends, along with the analysis, so they can get straight on with the dancing! "Dance Factory on PlayStation 2, Now this is brilliant! Dancing games - these ones you buy the dance mats for - Dancing Stage has been the key series for years. And what you've never been able to do on it is use your own music. And this time, for the first time, you can take any CD in your collection, put it in the PS2, and it generates dance steps for you on the fly, or you can make your own. Now, I've been trying this out at home, and ... it works really, really well..."
[Cox, giggling]: "Tried Radiohead or something?" [Minkley]:"...I tried it with Paranoid Android and it threw it a bit, but then I actually went in and I worked out my own dance steps along to Paranoid Android and it's brilliant! ... You can do your own steps, it will record it, then you play it back and you're just bouncing around to all the guitar bits and stuff and it's just superb fun. So if you've ever liked this type of game before, but you've always felt restricted by the songs on there, I mean, this opens up your entire record collection ... it's just brilliant, this is really really good fun." Although they are guaranteed to deliver a few laughs and lots of energetic posturing, the failing of most dance mat games is the dire selection of twangy hits licensed for the experience. Even Dance Factory comes with just five saccharine offerings, but then turns the genre on its head quite magnificently by allowing players to import their own CD tracks for fancy footwork treatment. The package also boasts some nifty secondary ideas to help to extend the title's replayability, such as a Fitness mode for calorie counters. Meanwhile, the multiplayer games include a knock-out tournament that can accommodate 16 players in rotation. An instant classic. No matter where your loyalties lie in the DDR world, there is no denying that Dance Factory is taking the right steps (no pun intended) in designing new ideas that the group of thinkers at Konami haven't come up with yet.... What Dance Factory brings to the table is new features that improve the genre, along with recreating already popular and proven modes for fans of the series. Yes, Dance Factory has a solo mode, multiplayer mode with elimination and tournament rounds, and even a cardio calorie-burning mode for the vain and/or overly sensitive. What sets this game apart is the track listing. You have five songs to choose from including "I Like It, I Love It" from Tim McGraw, "Get Down On It" from Kool and the Gang, "I Like the Way" from Bodyrockers, "Pon De Replay" from Rihanna, and "Don't Cha" from the Pussycat Dolls. With a track listing like that, how long do you think it will take before you are sick of these songs? Well fear not true believers, as the developers are not that lazy or stupid, in fact they are geniuses as they have implemented an option yet seen in a dancing title until now. Finally a dance game where you can dance to your own favorite music. Dance Factory features a CD recording mode that captures the beat of the song and creates dance patterns to it. You can use original CDs or your own burnt compilation CDs of your favorite tracks. It takes about 10 minutes for the software to create patterns out of a whole CD... It can generate 1/1, 1/2, 1/4, 1/8 and double steps; no 1/16 steps, but you can create 1/16 steps by recording your own dance pattern. However if your chosen music has a distinctive beat, the created patterns will probably follow it quite strictly.... You can also record your own steps... This is actually quite fun and it works pretty well, you just let the music play and you jump on the dance mat, making your own patterns... The coolest part is that you can finally use the dance mat with your own music. Good game, worth a try. Difficulty: Just Right Learning Curve: 30 to 60 Minutes Time Spent: 10 to 20 Hours "Worth playing" Other comments from players: "Highly addictive"; "massive replay value"; "THIS GAME IS AWESOME!!!! GET IT!" Dance Factory's rather ingenious USP is that it allows you to put any CD into your PS2 and it will convert it into arrows for your dancing pleasure. Simple, but absolutely superb. And it works. After experimenting with tunes from Rage Against The Machine, Air, Metallica, Sway and even a bit of classic old-school house, it would seem Dance Factory cannot be beaten. Using the same technology that fueled Vib Ribbon, the game picks out beats immaculately, creating combo opportunities at every turn. Obviously, not every tune you pick will lead to a perfect 'dance', but half the fun of Vib Ribbon was finding which tunes worked best, and the same can be said of Dance Factory. This is a game that's all about innovation, and this is the only way that Konami's dancing games could be bettered. Dance Factory is a superb product that deserves to be noticed, and as such Codemasters should be commended. Codemasters' entry in the dance mat rhythm action genre and a game which does away with the pointless faff of licensing half a dozen songs so infuriating they make you want to stove your brain in with the sharp end of your DualShock. Instead, its single, and utterly genius, gimmick is that you can slap in your own CDs and dance around like nobody's business. In fact, if you've played and enjoyed any type of dance mat game before, that's probably all you need to know about Dance Factory - oh, and that it works brilliantly. CD collection withstanding, Dance Factory is just about the best dance mat game you're going to find on PS2 - thanks entirely to its impressive track conversion capabilities... with its potentially limitless song list, you may never need to buy another dance mat game again. Best of all, it's an incredibly simple process - slot your CD into your PS2 while in the game, select the track (or tracks) you want to convert and - shazam - Dance Factory's off like the clappers. It's all very clever and, by and large, works brilliantly. During our rigourous tests, we threw a veritable smorgasbord of stuff its way. Impressively, Daft Punk, Pulp, Mint Royale, Muse and Kenickie (okay, we haven't really bought that many CDs since the 90s, but we'll get onto that in a moment) all magically transformed into perfectly playable dance-offs. SPOnG was lucky enough to be the first bunch of journos in the world to actually have a bit of a gawp and a bit of a jiggle around with mind-blowing dance mat game, Dance Factory. Why mind-blowing you ask? Well, simply because you can insert your favourite CD and the game will generate dance moves in time to your favourite tracks. Pure genius. Well here's the good news - our ingrained northern cynicism was totally unfounded. It actually works! ... it's the best dance mat game ever developed"
"Without hyperbole, this is the best thing to happen in all the universe, throughout history, since we emerged from the primordial ooze... if you've never danced to Morrisey while having your PS tell you you're a big fat sod, then you've missed out on one of the definitive human experiences. These 2007 releases use my CMStream game audio library for surround sound and DSP effects, on all four platforms. This is the first outing for cross-platform system programming work I've been doing since completing CMR5 in 2004. I gave a talk about this at the Games Developer Conference in San Francisco in March 2007. Follow this link for an interview about the PC version of the Rally game, or click here for details of the advanced surround sound on PS3 or if you'd like to hear about it from the horse's mouth follow this and associated links to online videos of what I had to say at the conference (parts three through seven of the 'Cross-platform OpenAL' presentation). Brian Lara Cricket 2007 combined the PS2 audio and streaming work I contributed to the previous hit release with new code, built upon OpenAL, for Microsoft game platforms. It was the first version of Lara with surround sound, using layers of reactive crowd ambience, as well as positional sounds from the pitch. A few months later rally driving game DiRT added support for Sony's latest console, including 7.1 channel sound with Ambisonic panning and full surround reflections, and went to number 1 in the UK PS3 chart. DiRT got great reviews and attracted awards for the game in general and the audio in particular. Over 12,000 readers of German news-stand magazines GamePro and GameStar voted Colin McRae DiRT 'Best PC sports/racing game' of 2007, beating off the latest versions of two other long-running franchises: Koanami's Pro Evolution Soccer 2008 and EA's Need for Speed: Pro Street, and the Spike TV awards voted DiRT 'Best Driving Game'. Specifically in audio and regardless of genre DiRT was pipped into second place (alongside Marty O'Donnell's Halo 3) in EDGE magazine's annual 'Best Audio Design' category, losing out to Mario Galaxy on the Wii - which indeed has stunning audio, though very different in style. I'm proud to have worked with Stafford Bawler and Adam Sawkins, lead audio designer and game audio programmer respectively, on that game. This is the latest outing for CMStream and scales the tech developed for DiRT up from intense single-car racing to a full grid of 20 cars, involving up to a dozen human players at once. 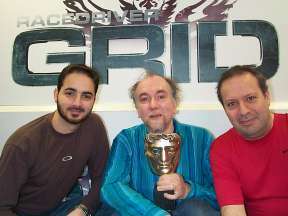 GRID won the 2008 BAFTA for best Sports game at the British Academy of Film and Television Awards in March 2009. I'd contributed codec, streaming and DSP tech to the audio systems on GRID's previous-gen parent, TOCA RaceDriver 3, but was not much involved in the game programming. GRID builds on the code I wrote for DiRT and Cricket, substantially extending it to include streaming features which were in the original CMStream for PS2 and Xbox1 (developed with Jon Mitchell) but had not previously been necessary on later consoles with far more RAM and more effective codecs, as well as the CMR and TOCA legacies of DiRT. Since random access to spiral-recorded optical discs is not much faster on PS3 and Xbox360 than it was on the previous generation - or older CD consoles, for that matter - it's harder to justify nowadays, especially when games like GRID also stream high-resolution graphics from the disc as they run. But with eight-layer interactive music and a vast speech database, any phrase of which could be triggered at any time, GRID could not fit all the main game audio into RAM even on a half-gig console, and so CMStream introduced reams of extra code to bring streaming up to scratch on new game systems. This time I was assisted by two other experienced audio programmers, recruited from companies spun off from the former EMI Central R&D labs - Aristotel Digenis and Pete Goodwin (no relation). So Codemasters Central Tech Audio is now a team of three, rather than a one-man band, and we are working on new DSP, tools and related systems for Codemasters EGO game systems, the latest incarnation of the Neon cross-platform engine and the tech behind several games now in development. GRID takes the advanced audio systems used for single-car rally racing in DiRT and extends those to model 20 vehicles racing at once - mixing 760 sound sources for the cars alone, PLUS music, collisions, damage, crowds and many other ambient sounds. GRID plays several banks of interactive music, eight layers deep, positioned in surround around the player, adapting to their performance and position in each race. It also tailors the crowd sounds on the fly to cheer or boo depending upon what you and other players have recently done (whereas the 'interactive crowds' in Colin McRae 2005 only varied from one stage to the next, depending upon championship performance). As well as more than an hour of sounds instantly-accessible in memory and mixed on the fly - extending the intricate system used in DiRT - GRID seamlessly streams context-sensitive speech and music, as well as graphic data, from disc as you play the game, squeezing yet more varied audio from the console or PC hardware. GRID uses well over 100 simultaneous audio filter and reverberation effects to further tailor each sound to its context and player activity. This ensures that the game sounds vary as you play and the differences can make a difference to how you play, by telling you more about what's going on in the race, especially and most importantly off-screen. GRID audio systems use sub-bass Low Frequency Effects and controller shocks together - what we call 5.1.1 sound - for crushing impacts and rumble strip feedback that you can really feel as well as hear! GRID now uses Ambisonic techniques for immersive surround on Xbox360 as well as PS3. Ambisonics were developed by Oxford mathematician Michael Gerzon in the 1970s and have since become the focus of 3D surround sound research worldwide; Gerzon's original work was funded by the UK NRDC (National Research and Development Council) and the trade mark and patents (now lapsed) were bought by classical music recording company Nimbus. But like Alan Blumlein's pioneering work on stereo at EMI in the 1930s, it has taken decades for hardware makers to catch up, and games - rather than cinema - appear to be the 'killer application' where precise surround - rather than vague ambience - is crucial. In brief, Ambisonics means all the speakers work together to create realistic soundfields, rather than just picking the nearest one or two for each direction - a difference that really has to be heard to be appreciated - once you've heard Ambisonic surround, typical cinema and game panning just sounds fake (which it is). Almost all the sounds in GRID on PC are in uncompressed PCM format - so at last players can hear the sounds at the full quality of our original recordings (especially with X-Fi advanced mixing and effects). Even so, close collaboration between Codemasters and Creative Labs, developers of the most often-used OpenAL drivers, mean the sound systems in GRID are far more efficient than those in DiRT and the full audio design runs even on minimum-spec PCs without significant impact on the frame rate. Yet PC specs march on, and GRID is one of the few games that takes full advantage of quad-core systems and the latest multiple GPU configurations. So if you've got all the latest hardware - necessarily including an X-Fi with the EMU20K DSP chip and good headphones with CMSS 3D or 7.1 speakers - the PC version of GRID can now outperform the current generation of consoles. In practice they're all more often limited by the listening environment and speaker systems than by the audio tech in the game - but if you really care about sound we've done the work that'll make your system sing - and you can be the conductor! The sequel to DiRT combines technology from GRID and the original, plus new granular synthesis and Ambisonic soundfield technology, drawing together the biggest audio team yet for any Codemasters game, and especially noteworthy contributions from my colleagues Aristotel Digenis and Rob Pattenden. The game is particularly impressive in surround - the more speakers, the better! The console versions make pioneering use of the concept of volumetric emitters, in which almost every sound in the game has an appropriate size, rather than being rendered simplistically as a collection of point sources - still the norm for games, though not the real world. DiRT2 is built upon NeSound, the latest incarnation of my CMStream cross-platform audio system, now fully integrated with Codemasters' EGO engine. As well as support for hardware-accelerated audio on all versions of Windows from XP through Vista to Windows 7, for the first time it includes genuinely periphonic 3D loudspeaker audio options, via HDMI on the PS3 and the Rapture3D advanced OpenAL driver, from Blue Ripple Sound, which is ideally suited to modern multi-core PCs. This '3D7.1' option is the first commercial fruit of talks and demonstrations I gave at the International Conference of the Audio Engineering Society in London in February 2009, illustrating how practical 3D sound could be delivered via existing 7.1 channel audio hardware, while retaining compatibility with existing stereo and Cinema 5.1 media (reported in Develop magazine), earlier discussions with Sony, Creative Labs and the Interactive Audio Special Interest Group (IA-SIG) at the 2007 Games Developer Conference in San Francisco, and the European SpACE-NET spatial audio academic network, where I met Ambisonics expert Richard Furse of Blue Ripple and introduced him to OpenAL as an ideal source of high-def 3D audio for his uniquely powerful and scalable higher-order soundfield tech, since used to test and demonstrate GRID, DiRT and other games, in 14.1 channel 3D surround sound. DiRT2 brings practical 3D loudspeaker audio capabilities out of the lab and into the homes of over a million gamers, but this is just the start - impressive though DiRT2 audio is, you ain't heard nothing yet! Codemasters is collaborating with the biggest names in the games industry, and other respected organisations like the AES and BBC, to develop game audio from a junior partner of the music and movie industries to a leader and exemplar. With games now turning over more cash at retail and online than either music or home cinema, and arguably the primary source of HD audio and video worldwide, we have reached a tipping point where innovation in games can lead the way to truly immersive audio. Surround sound in cinema is a luxury, often erratically used. Gamers deserve better - for them it can be a matter of life and death! 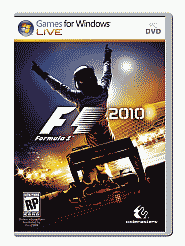 In 2009 Codemasters signed up the rights to develop games based on the Formula One world championship, and our Birmingham Studio was assigned the task of developing this game for the current lead platforms, building on the tech used in DiRT and GRID. The main technical advances in F1 2010 are the use of granular synthesis for non-player car sounds as well as the player's engine, and an elaborate reflection system prototyped by Rob Pattenden and production-engineered by Hugh Lowry, which models the intricate echos and pass-by sounds as cars and listeners move around the circuit. Ambisonic soundfields are again extensively used in the game and in the paddock, ensuring that the game makes best use of 7.1 surround sound on PC and PS3 - in two or three dimensions - without compromise to the mono, stereo and 5.1 channel surround mixes. Custom HRTF options in the Rapture3D OpenAL driver optimise the surround-sound experience for PC players who prefer to listen on headphones. All the sound design and much of the audio programming for F1 was done at our Southam HQ, by the team responsible for DiRT2 - the Central Tech Audio posse of myself, Aristotel Digenis and Pete Goodwin, plus game audio programmer Adam Sawkins - assisted by new hires Lars Hammer and Andy Morris at the former Rage/Swordfish studio in Birmingham. Sound design drew on the skills of Andrew Grier, Mark Knight, Jon Newman, Stephen Root, Dave Sullivan, Ed Walker, Pete Ward and Claire Woodcock, making this the biggest audio project yet to emerge from Codemasters. Follow-up F1 2011 built on the same NeSound custom audio tech with more input from the Birmingham posse, including greater use of stereo sounds in the front end and full Ambisonic soundfields for the paddock and garage ambiences, terminal damage effects, loading and other transitions including scenes after qualifying and each race. These fourteen custom soundfields are rendered in mono, stereo, 2D or 3D on PS3 (via HDMI and 3D7.1 speakers) and in that layout and many others, and on headphones with HRTF modelling, on PC through Blur Ripple's Rapture3D OpenAL driver which was again bundled with the game. As well as these premade soundfields all the platforms use Ambisonic mixing for around 130 individually-positioned voices, hybrid third-order on PS3, first-order on Xbox and up to fourth order on PC depending upon hardware spec. The mandatory switch from XAudio to XAudio2 required some minor trimming on XBox360 but additional parametric equalisation - based on code I'd written for Silicon Studio decades before - helped improve the quality of the engine sounds on all platforms. The 3D 7.1 mix on PS3 was tweaked slightly, applying the 'tilt' suggested following Audio Engineering Society reviews of the scheme, to make the front and rear triangles parallel with walls rather than floor and ceiling. The difference is subtle and within the variability of playing postures, but improves compatibility with 5.1 cinema surround mixes. It's the layout shown in figure 6 of my AES paper..
Shooters! Bodycount was the first Codemasters combat game with audio in 3D on PS3, using my tech. There was no PC version. The last two Operation Flashpoint projects were derived from the externally-developed PC hit. These used bought-in FMOD middleware so they lacked the Ambisonic 3D features of our racing games, though I did spend six months tuning up OFP Dragon Rising to make best use of the mixing and streaming resources available - but the Guildford Studio project Bodycount showed what NeSound could add to a 3D shooter. Bodycount also pushed the X360 hard thanks to further optimisations and extensions for NeSound running via XAudio2, programmed by Andy Mucho. The PS3 version running on a single SPU co-processor was cranked to to 256 voices, each running through a fast ATRAC3 decoder and a 1024 element FFT/DFT for tonal tweaking, with six directional reverbs, but even this work and 3rd order Ambisonic panning didn't stretch Sony's extraordinary co-processor, which apparently 'played whatever we threw at it' with no need for further tweaks. I did learn one important new thing from this game, which is that in a full 3D game like this, with enemies crawling around in buildings above, below and behind the player, the overhead reverb needs tweaking depending upon the location - the sky is rather boomier than intended when you're out in the open! Sadly this was the only project completed by the Guildford Studio and its subsequent closure resulted in my long-time collaborator Pete Goodwin briefly leaving the games industry. I'm glad to say he's now working with Jason Page at Sony Europe in London, where the unrivaled PS3 Multistream audio system was born. Many of the audible advantages of our games on PS3 stem from Multistream - combined with Ambisonic extensions and the cross-platform capabilities of NeSound and its predecessor CMStream which I wrote with Jon Mitchell. In particular Sony's ATRAC3 codec enabled us to get more audio into less RAM, at high quality and with excellent surround and streaming compatibility. The main audio extensions in the third and fourth incarnations of the DiRT driving series related to the in-built YouTube capture, which includes an adaptive custom game audio remix rather than the easy option of padding muzak. Rapture3D remained a built-in feature on PC, with incremental updates and improved HRTFs for 3D headphone listeners. Race Stars marks a return to Nintendo development for me - the last such game I worked on was Drome Racers at ATD more than a decade before, and the audio tech was immediately recognisable from my GameCube experience, with the advantage of HDMI 5.1 output and the ability to play sounds via the WiiU's distinctive tray peripheral as well as Wii controllers. On the established platforms Race Stars uses a combination of mature NeSound platform runtimes and new design tools closely integrated with the latest update of the EGO game engine, supervised by Aristotel Digenis who had by then risen to the rank of Senior Programmer. The WiiU version was released later, in 2013 with extra features and content, initially in Japan only. A modified version of this game, adapted for free-play on mobile devices, has since been released on Apple's iOS. It can be downloaded at no cost from the App Store. This small project was especially fun for me because it involved leading all aspects of the audio work, from design through game programming as well as runtime tech, while still able to draw on the expertise of the large sound design team at Codies. The resultant game uses fewer voices and DSP effects than the PS1 original, and deliberately includes many of the same samples, yet sounds a lot richer as these are no longer compressed, taking advantage of the extra RAM available nowadays, and many hifi assets from DiRT, GRID and even a few from the F1 series have found their way into the mobile remix. All four wheels have independent physics, skid, scrub and surface sounds, most apparent if you listen on headphones, and dynamic mix adaptations mean the co-driver pace-notes are clear even if you choose to play the game with your own music from iTunes or similar apps alongside. The pace notes are exactly as they were in the 30 featured rally stages from massive hit Colin McRae Rally 2, voiced by Colin McRae's co-driver Nicky Grist; in this case many of them are as remixed for Dreamcast and amusement arcade versions of Colin McRae Rally which did not see release at the time but cut through very well on modern mobile platforms. 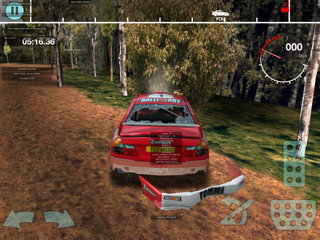 The engine replay system is based on the approach used in DiRT and GRID (pioneered in Race Driver 3) rather than old-school crossfaded loops, and all mixing is performed at 48 KHz rather than the usual Unity Engine/FMOD mobile default of 24 KHz (except on the iPhone 4 version, which is dynamically trimmed to make best use of that relatively slow platform). Crowd and other ambiences owe more to CMR5, as I'd worked on that game to improve those aspects; hundreds of them were carefully placed in-game by a freelance designer Tom McCaren who subsequently and deservedly landed a full time job at Codies. The producer of Colin McRae Rally for iOS was Pete Harrison, who also took resonsibility for the very successful reworking of Race Driver GRID playing on Sega cabinets in an amusement arcade near you. Pete has a background in audio, having being European Tech Evangelist at Creative Labs a decade before, instrumental in the support for 7.1 surround and advanced CMSS3D headphone support in Colin McRae rally games from CMR4 onward, and the advantages of having an audiophile producer cannot be understated, from my point of view. Listen to the game - it's a couple of quid on the app store - and hear what I mean! Quick ports of the iOS product I worked on have since been released by various publishers for Android, Blackberry, Apple OS X and Steam PCs. 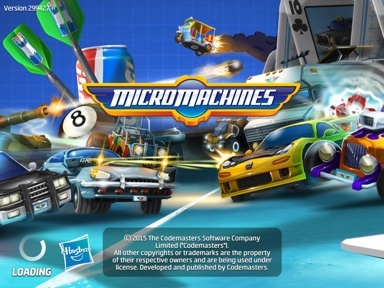 My final Codemasters credit was for work on the Mobile versions of MicroMachines, licensed from Hasbro and published by EA subsidiary Chillingo. The Ego 2.5 engine tech was credited to me and my colleague Adrian Smith in Southam, last men standing in the once 30-strong Central Tech department, with gameplay from a small group in the Birmingham studio which mainly makes Formula 1 games for consoles and PCs. The latest F1 mobile game was outsourced and Ade works on the Colin McRae Rally team now, as CT closed a few days before I left. So I was both the first programmer in Central Tech, and the last. 12 years is not a bad run, especially given the multi-million selling number ones we shipped along the way. 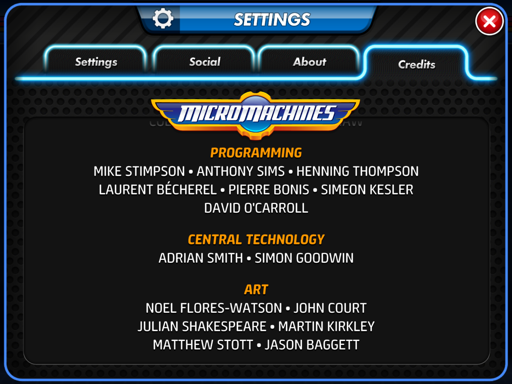 Dean Bilotti deserves strong recognition for the Ego engine mobile rendering systems, though the only credit that hinted at this was for Toybox Turbos, which came out on obsolescent consoles but never surfaced on iOS or Android though we had playable versions of that and several other unreleased titles in-house before he left. 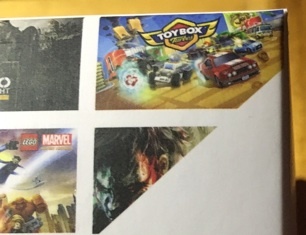 It even featured on the retail packaging of the Nvidia Shield console, though sadly not inside (see photo right). Dean reinvigorated CT and played a major role in almost all titles made during the 'dash for mobile' as the department otherwise dwindled. He works for Apple now. As in any console studio, where high dev budgets are still dwarfed by the product release costs, I worked on many other games lost to licence and investment gambles, console and tech transitions, including: Colin McRae Redline, with awesome audio made with my erstwhile sidekicks Staff Bawler and Jon Michell; Operation Flashpoint Middle East Crisis, the first proposed followup to Bohemia Interactive's PC-only OFP and an early experiment in Ambisonic soundfields with ace designer Ben McCullough, who I'd love to have worked with more; and another transitional rally title for PC and Xbox360, one of three internally labelled 'CMR7' games, prototyped then canned before Neon Engine, Ego and PS3 changed the landscape decisively to make Colin McRae DiRT and RaceDriver Grid possible. But overall the work that shipped more than vindicated Chris Southall's decision to create a new Central Tech department over the ashes of the old Core team (leaders of whom founded Freestyle Games) and to appoint me, an audio specialist, as the first programmer, joining 'white hat hacker' and security specialist Murray Rigluth, who ended up running Sony's DADC plant in Austria. When Chris left for Sega his successor as CTO, Bryan Marshall, now at Nominet, grew the department and made the case to make the new in-house game engines - Neon Engine, then Ego - central to Codies' successes on Playstation 3 and Xbox. I should also say thank you to the dozens of sound designers and handful of game audio programmers I've worked with at Codemasters. In my role as Principal Programmer (Audio) I was directly answerable to both the Audio Director and the CTO, and indeed hired to bridge those departments and the game team programmers, which had previously sometimes communicated more by dead letter drops than active collaboration. Not only did we get get some great audio tech that way, we also got more technically-adventurous sound designers and greater audio-awareness elsewhere in the company. I'm especially proud of Dance Factory, which emerged to generate four patents in my name as well as millions of pounds of profits after three years of progressive refinement. Working with Adam Sawkins on that, as well as DiRT and Grid, was exciting and insightful. The Ambisonic mixing tech used in those and subsequent BAFTA-winning titles is arguably my greatest contribution to modern gaming - through 12 million games shipped, grossing half a billion pounds, and demonstrations for the Audio Engineering Society and firms like Audio Kinetic which spread the idea far beyond Codemasters. Ambisonics is now recognised as crucial to VR and advanced surround in games and other interactive systems, as I gambled it would be at the turn of the millennium when it seemed to be just another failed NRDC project. It was just decades ahead of its time. No tale of Ambisonics, especially in the UK, should end without a tip of the hat to the Three Doctors of 21st century surround sound, Dave Malham, Richard Furse and Bruce Wiggins; the sonic visionary mathematician and explainer, Michael Gerzon; and Alan Blumlein without whose 1930s inventions we might still be listening to mono discs made of crushed beetles. Like Newton, and Noel Gallagher, I have stood on the shoulders of giants - thank you all.